Keyword research is one of the most important parts of developing an SEO strategy. You need to know what keywords you need to target, and to do that, you need to know what your target audience is searching for on Google. You want to find the keywords where you can compete for a spot on the first page, but that also bring conversions. SEO agencies use paid tools like Moz Pro, Ahrefs, and SEMrush, all of which provide detailed keyword research functionality with information about things like search volume. However, if you’re just starting out and you’re handling your own SEO, a subscription to professional software tools is probably out of budget. It used to be that for keyword research, there was a great free alternative from none other than Google itself: Google Keyword Planner. It gave relatively accurate data about search volume, for free, helping business owners and internet entrepreneurs do thorough keyword research without needing to spend money on a paid tool. This was true until July 2016, when these golden days came to an unexpected end. Unfortunately, the days of free access to detailed search data from Google Keyword Planner came to an end during the summer of 2016. Unexpectedly, Google restricted access to Keyword Planner for anyone who wasn’t above a certain spending threshold in Google AdWords, their pay-per-click advertising service. This wasn’t entirely true. They were, in fact, making some major changes to who could access full search data through Keyword Planner. 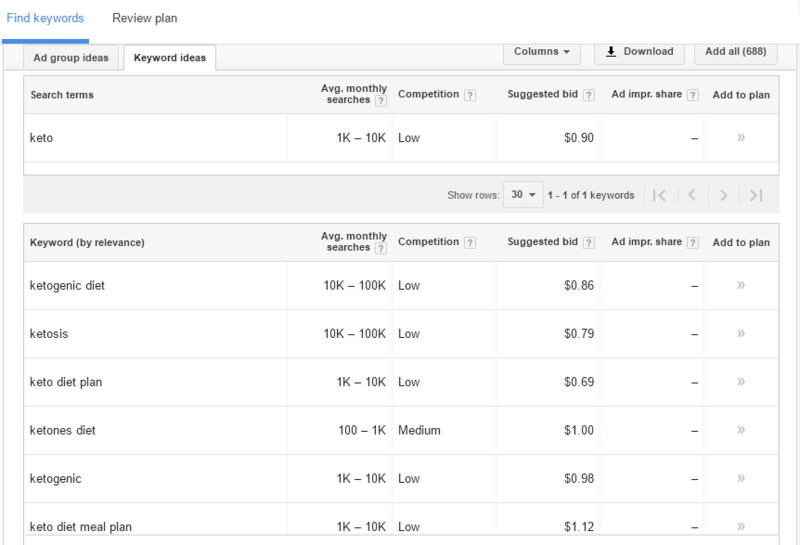 Today, you can still access and use Google Keyword Planner without spending money on PPC. But, there’s a huge catch, which wasn’t there before. The search volume information that it gives you offers such a broad and vague numerical range that, frankly, it doesn’t really tell you much of anything useful. You can see what I mean in the screenshot below. As you can see, 10k-100k is a ridiculously broad range. While Google Keyword Planner can give you new keyword ideas, it really doesn’t tell you a whole lot anymore about how many people are actually searching for each keyword. At least, not unless you’re spending a significant amount of money on AdWords advertising. Naturally, if your budget won’t allow for a paid subscription to a professional SEO tool, you need to find alternatives to Google Keyword Planner. Fortunately, there are quite a few of these out there. Fortunately, there are quite a few of these out there. Some tools offer search volume data, while others don’t. However, quite a few of them can be very, very useful for keyword research. I’ve decided to create a master list of the best free keyword research tools out there, as of 2017. I did the very best I could to make sure this list is as comprehensive as possible, listing multiple types of free keyword research tools that can be useful for small businesses, bloggers, affiliate marketers, and anyone else who handles their own SEO. I did the very best I could to make sure this list is as comprehensive as possible, listing multiple types of free keyword research tools that can be useful for small businesses, bloggers, affiliate marketers, and anyone else who handles their own SEO. I’m starting off with the ones that are completely free, and that also offer search volume information. Some of them do have paid versions as well, many of which are quite affordable. In most cases, the paid version will allow you to do a greater number of searches per day. You may or may not need it, but many of these tools are quite a bit less pricey than agency tools like Moz Pro, Ahrefs, and SEMRush. In most cases, the paid version will allow you to do a greater number of searches per day. You may or may not need it, but many of these tools are quite a bit less pricey than agency tools like Moz Pro, Ahrefs, and SEMRush. Next, I’ll list the paid tools with free trials that you can take advantage of. These free trials can allow for anything from a few searches, to a full month of unlimited use. Third, I’ll talk about the longtail keyword tools that don’t offer search volume information, but that can still be a great way to get keyword ideas. Many of these tools can be incredibly valuable for brainstorming new content ideas, too. If you’re stuck in a rut, they can bring up questions your audience is asking, but that you never thought of. This can be fertile ground for blog posts, not to mention an opportunity to rank for potentially profitable longtail keywords. This can be fertile ground for blog posts, not to mention an opportunity to rank for potentially profitable longtail keywords. For all of the tools that offer search volume data, I’m doing something a little different. I’m actually going to compare the data they offer with the data available from the paid tools my agency uses. This can help you get a better idea of how accurate these tools probably are. Keep in mind that even with paid tools, you probably can’t trust search volume data to be 100% accurate. However, it’s a very useful approximation that can help you a lot with your keyword research and SEO strategy. 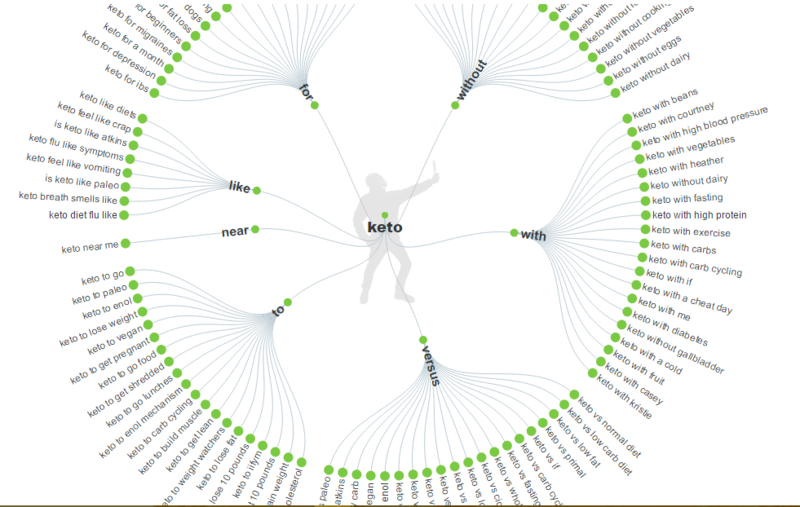 To take a look at results that these tools provide, I’ve used “keto” and related terms as the test keywords. “Keto” is short for “ketogenic diet,” a very low carb, high fat, and high protein dietary regimen that’s gained a lot of popularity recently for weight loss. So, here it is: my ultimate list of the very best free keyword research tools for 2017. Created by longtime SEO professional Aaron Wall, the site has a fascinating and comprehensive blog that’s not afraid to talk about topics that many other blogs don’t cover in detail. There are also quite a few useful SEO tools, one of which is the SEOBook Keyword Tool. To use the tool, you’ll need to sign up for an account. However, it’s completely free to sign up, so you don’t need to pay for a subscription or anything. There are also tons of other helpful resources and tools on the site, so I definitely recommend signing up and checking it out if you’re handling your own SEO. 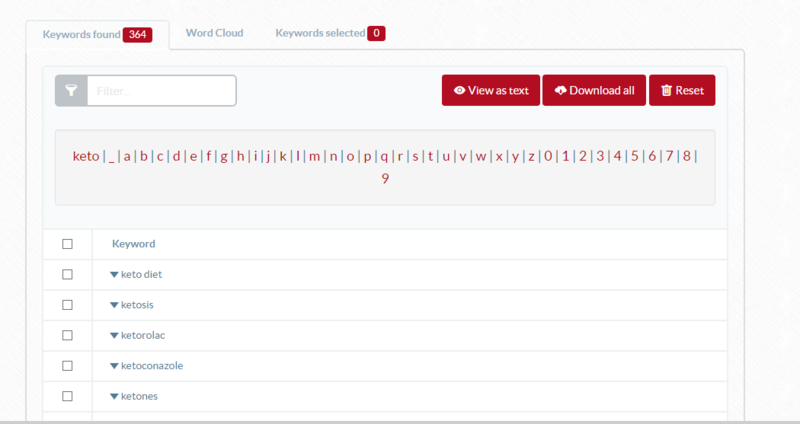 The SEOBook Keyword Tool does, in fact, provide keyword data. You can see total monthly searches, total daily searches, monthly searches in the UK, and even searches on Yahoo and Bing. If you sign up and check it out, you’ll notice that they also provide a column-by-column description of what all of the information means. They also give some information about how it works. 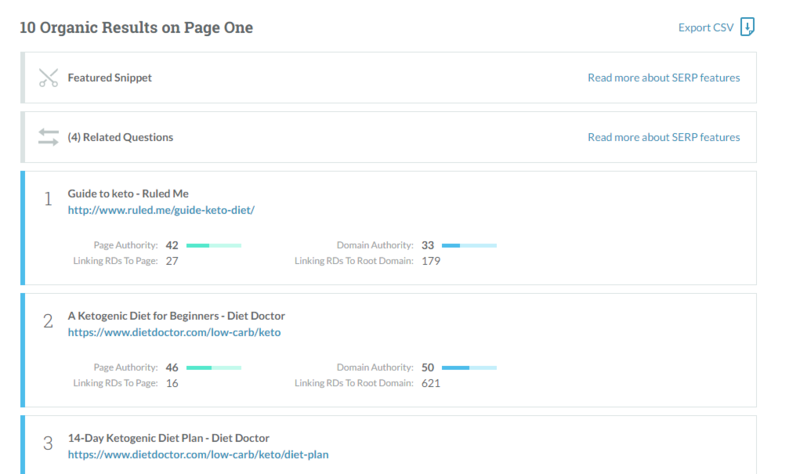 Here’s a screenshot of what you’ll get if you type “keto” (as in ketogenic diet) into the SEOBook tool. This is just a picture of the top of the list. There are a lot of other longtail keywords listed. As I’ve mentioned, this tool is completely free. But how does it compare to the professional software that we use in digital marketing agencies? Let’s take a look and see. Already, we can see that both tools have generated a rather similar list of top related keywords for “keto.” You can also see that the search volume information — that’s “Daily Searches” in the SEOBook Keyword Tool, and “Volume” in SEMRush — is quite close. Keep in mind that search volume information from any tool, even Google Keyword Planner, isn’t necessarily 100% accurate. The volume information from the SEOBook and SEMRush are close enough that both give an accurate picture of what kind of numbers you’re looking at. 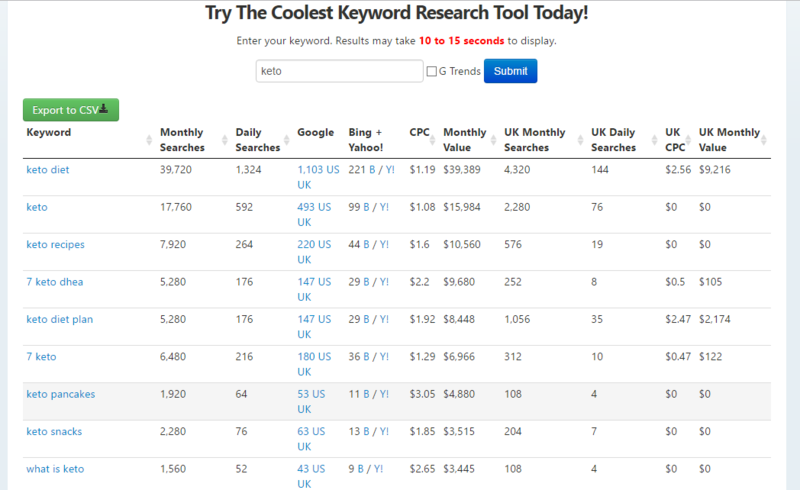 Interestingly, there is a little difference in the top keyword results you see from each tool. But, both complement one another. For example, you’ll see “keto pancakes” in the SEOBook screenshot, but not the SEMRush screenshot. There’s a content idea right there: awesome recipes for keto-friendly low-carb pancakes. You’ll also see “keto snacks” in there. With both tools together, you can see a trend here: people are looking for recipes for meals that won’t interfere with your ketogenic diet. Keep in mind that keto requires people to consume a very, very low carbohydrate intake, often below fifty grams per day. So, some creativity is sometimes needed. 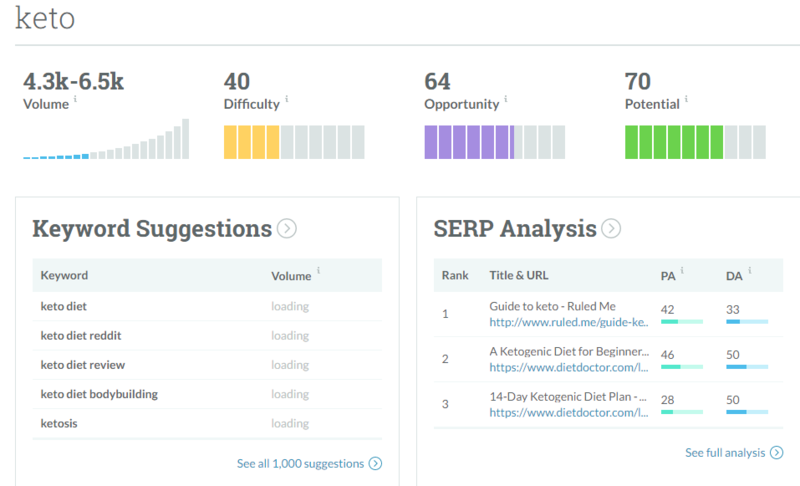 Serps.com is another website that offers a useful free keyword search tool. They also have several paid plans, each of which offers a 30-day free trial. Founded in Portland, Oregon in 2012, Serps.com tracks data from over 20,000 keywords for a total of approximately two million keywords. Here’s a screenshot of what comes up for our test keyword, “keto.” These are global results, not results specific to the UK. Even if you don’t plan on paying for a monthly subscription, signing up for their 30-day free trial can be helpful if you’re in the keyword research phase for a new website. It’s a great tool, it’s free for a month, and you can easily find all kinds of surprising longtail keywords that you can target. But, how does this one compare to professional tools? As you can see, the results are quite similar, but not necessarily identical. Both tools point you toward things like “keto diet plans” and “keto recipes,” as well as “keto calculator.” The latter, for reference, refers to online tools that people can use to track their macronutrient intake, keeping carbohydrates low while making sure they’re getting enough protein and dietary fats. At the same time, though, you’ll see a couple of differences. This makes a case for using these kinds of free tools as a supplement for keyword research, even if you have a subscription to a tool like SEMRush. Well, it turns out that one of the biggest communities for keto dieters is actually the /r/keto subreddit, a forum hosted on Reddit. 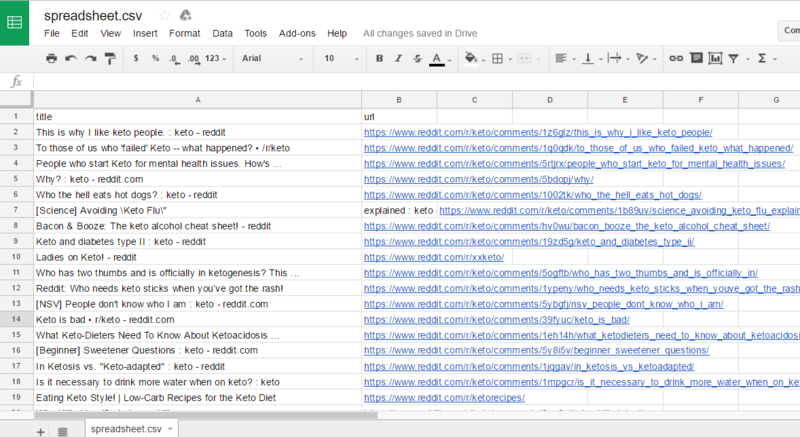 Checking out /r/keto could be a gold mine for content ideas, and if you didn’t know about it, now you do. Like Serps.com, KW Finder is a very good paid tool that happens to have a very useful free trial version that you can take advantage of. Even better, you don’t even need to give them your credit card information to sign up for the free trial. For free, you can get up to three keyword searches per 24-hour period. It will give you 25 related keywords per search. You will also get three SERP checks per day. 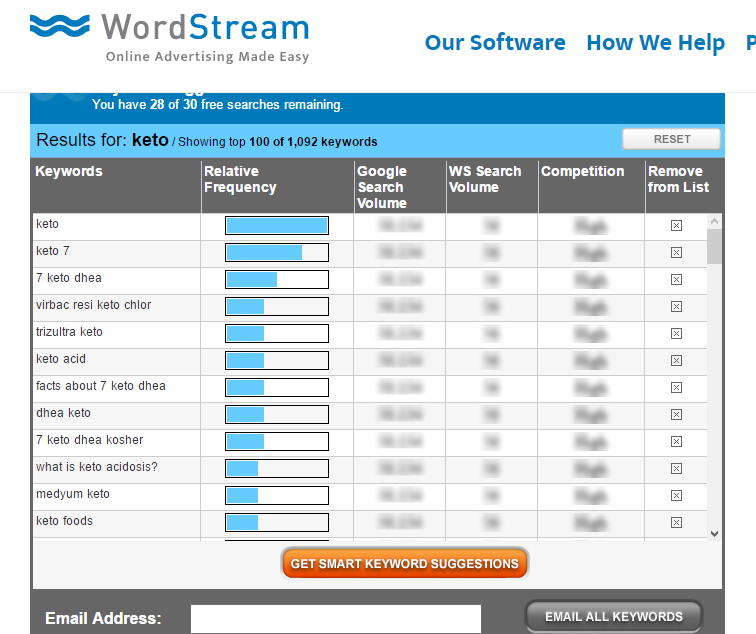 Here’s a screenshot of what you’ll get if you type “keto” into the free version, with results filtered to the UK only. The left has the keyword suggestions. Over on the right, you’ll see the SERP Checker data. This shows the top results for that keyword. You can also see monthly search volumes over the past year. As you can see, like many search terms related to dieting and fitness, “keto” sees a January spike due to New Year’s resolutions. So how does KW Finder compare to SEMRush? Let’s take a look and see. As you can see, we’ve got some similarities and some differences here. KWFinder pulls up some interesting keywords that aren’t as prominent in the SEMRush results, like “keto diet meal plan” and “ketogenic diet foods.” While these may already be fairly high competition, they can help seed new ideas for profitable long tail keywords. You can also see that for “keto diet plan,” KWFinder and SEMRush are showing similar search volume information. 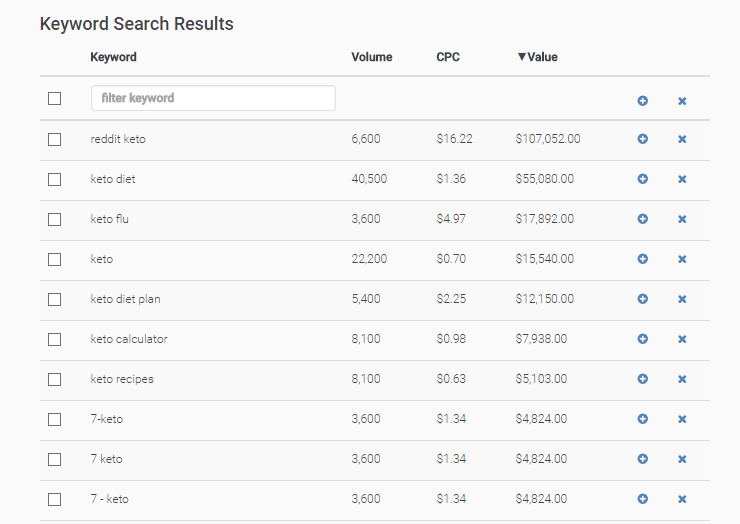 The same goes for our head keyword, “keto.” The numbers aren’t identical, but even if you compare search volume information from two professional paid tools, they’ll be close but not necessarily 100% identical. The cool thing about KW Finder is that you don’t need to pay for a subscription to use the tool, you’re just limited to a certain number of daily searches. If you’re just doing keyword research for your own business’s website, or for a personal project like a blog or affiliate review site, this might be all you need. SEMRush is a professional-level paid digital marketing toolkit, and as you can see, we use it in our digital marketing agency. I’ve had a great experience with their software, and if you’re in the market for high-powered SEO software, I definitely recommend SEMRush. However, we’re giving them a mention here because they offer a free 14-day trial. Taking advantage of this offer could end up being very helpful for you. If you click the link and sign up for the trial, you’ll be using a promo code that activates said free 14-day trial. This is valid until September 10, 2017. SEMRush offers 10,000 results per report, and you can create up to 3,000 reports every day. Along with keyword research, you’ll also have access to advertising research, site auditing tools, a Keyword Difficulty tool, and more. If you click the link and scroll down, you’ll see the full list. Be advised that in order to use your free 14-day SEMRush trial, you will need to provide your credit or debit card information. However, there isn’t any charge for the trial. Unfortunately, SEMRush isn’t exactly cheap, so if you’re reading this, it’s probably not the ideal paid tool for you right now. Moz Pro is a professional SEO software suite used by digital marketing agencies, as well as in-house teams at large companies. Like SEMRush, its pricing can be out of reach for many small business owners, but you can try out the Moz Keyword Explorer tool for free. Moz Pro also offers a full 30-day free trial that you can take advantage of. With the free online version of Moz Keyword Explorer, you’ll get two free searches per day without logging in. If you register an account, you’ll give five searches a day. Here’s a screenshot of what you’ll see when you type in “keto.” These results are localized to the UK. The search volume data did not want to load correctly when this screenshot was taken, but feel free to check it out for yourself if you’d like to get a better idea of search volume for these particular keywords. There’s also an option to view a full analysis underneath the SERP Analysis section. 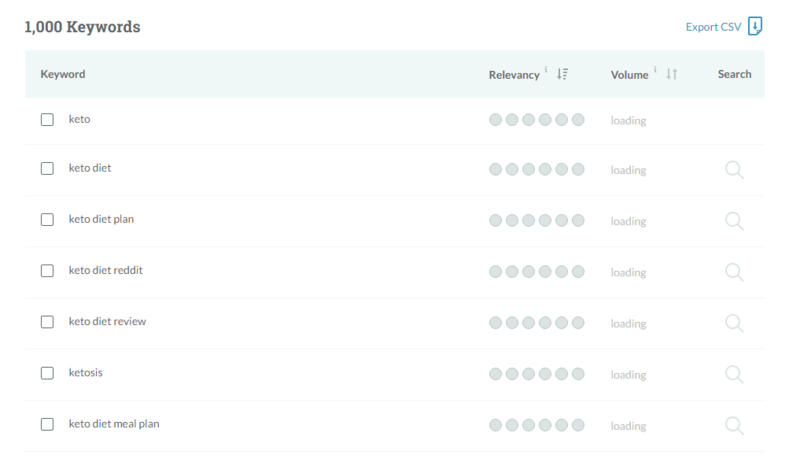 Moz Pro Keyword Explorer is definitely worth checking out, considering that it’s one of the most widely used SEO software tool suites in the digital marketing industry. Although your daily searches are limited, you can still get plenty of valuable information for free. Here’s our SEMRush screenshot again, for comparison. At this point, we’ve covered the keyword tools that are completely free, as well as paid tools that have limited free trial versions. The humorously named KeywordShitter was created by a Reddit user, and it actually uses Google’s suggested searches to find longtail keywords. It’s a great way to not only find relevant keywords, but also to get new ideas for blog content. You’ll often run across questions that your audience is asking, but that hadn’t occurred to you before. It generates tons of keywords, and you can always pick the ones you like and then run them through a tool that provides search volume information. As I mentioned, if you’re stuck in a blog content rut and you’re not sure what to cover next, KeywordShitter can definitely help. As you can see, it brings up all kinds of interesting things that people are actually actively searching for. If you’re stuck in a content rut for a website about losing weight with the keto diet, suggestions like “keto pancakes,” “keto appetizers,” and “keto alfredo sauce” could help you come up with new ideas for blog posts. Keyword.io is somewhat similar to KeywordShitter. To use the tool, you’ll need to go ahead and sign up for a free account. This is a quick, easy process. The keywords are listed in alphabetical order, and as you can see, there are quite a few interesting longtail queries listed. Up at the top, there’s an option to filter ideas. You can either type something in, or use the drop-down menu labeled “Filter Ideas” to choose from pre-generated filters. Ubersuggest works in a similar way to KeywordShitter and Keyword.io. Interestingly, it was recently acquired by digital marketing guru Neil Patel, who plans to add more free features to the site in the near future. One of Ubersuggest’s advantages is that it can bring up longtail keywords that aren’t listed in Google Keyword Planner. This can help you find interesting and relevant topics to write about, for which you can probably rank quite easily. 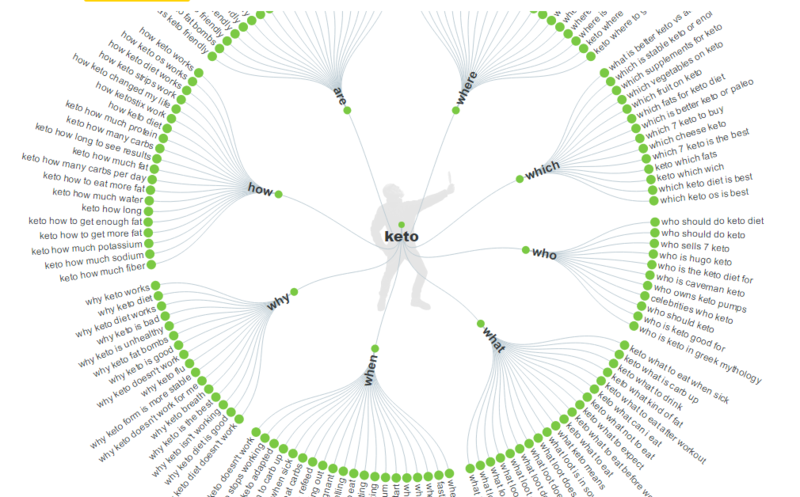 Here’s a screenshot of what you’ll see for the initial keyword “keto,” filtered to the UK. As you can see, you can download the entire list in one simple click. 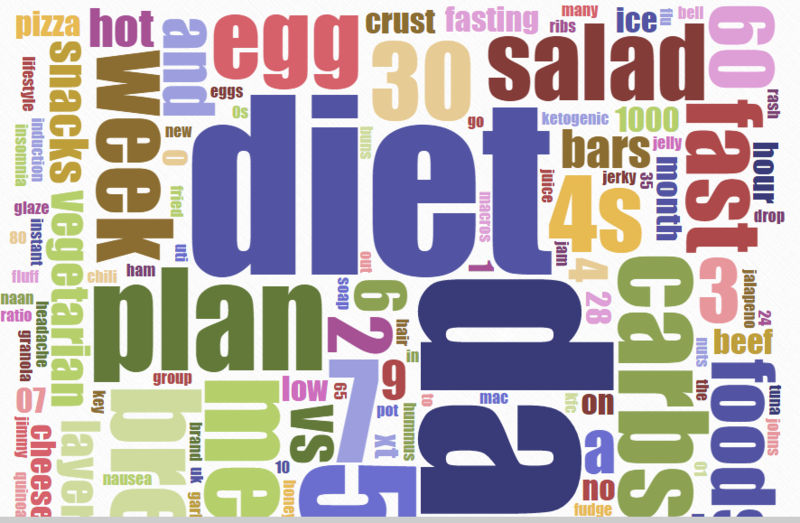 Another cool feature that Ubersuggest offers is a word cloud, which is generated from the keyword list. Not only are the word clouds quite pleasing to look at, but they can also help you get a better idea of what words and ideas tend to be correlated with your main head keyword. This is actually just the top of the word cloud, and there’s more to it. But this should give you a good idea of what Ubersuggest can generate for you. These word clouds can be useful because, in a convenient visual format, they help you find correlations. This, in turn, can point to new content topics you can use to write epic content that ranks. But look closer, and there are all kinds of interesting things in there. For example, “vegetarian.” Ketogenic diets are high fat and high protein, with little to no carbohydrate intake. When people think of “keto,” they usually think of things like bacon and other meats. Getting adequate protein can already be somewhat challenging for vegetarians, so there are definitely people out there who are losing weight with keto while remaining on a plant-based diet. These foods all have carbohydrates, of course, but people always want to find ways to indulge in their favorite foods without blowing their entire weight loss diet. So, keto-friendly alternative recipes for these kind of foods, like “pizza” with a crust made from cauliflower, are a type of content that often performs quite well in this niche. This can help you plan content that your audience will love — and that other publications will want to link to. So, keto-friendly alternative recipes for these kind of foods, like “pizza” with a crust made from cauliflower, are a type of content that often performs quite well in this niche. This can help you plan content that your audience will love — and that other publications will want to link to. Keyword Tool is yet another helpful keyword research tool that gets its longtail keywords from Google’s search suggestions. It provides over 750 longtail keyword suggestions, completely for free. Here are the results for “keto,” filtered to the UK. 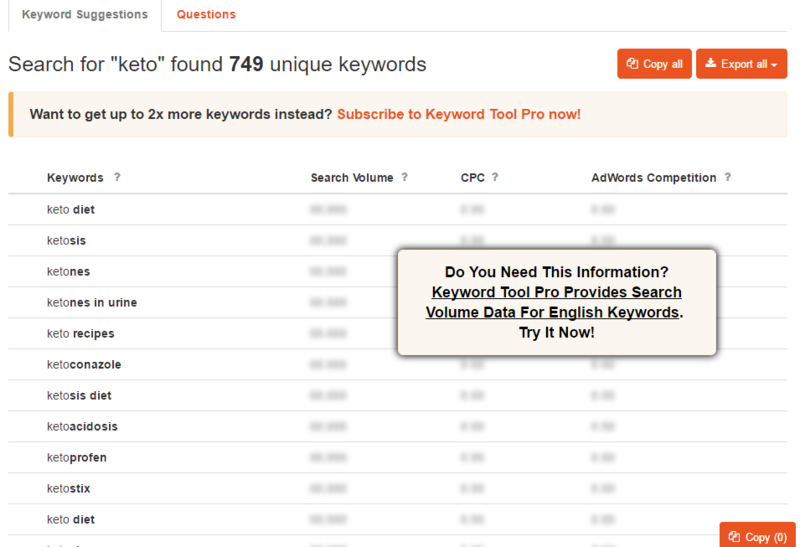 As you can see, you do need a paid subscription to Keyword Tool Pro to access search volume information. Wordstream is a company that makes software for cost-per-click (CPC) advertising. They also happen to offer a free keyword tool, which gives you a total of 30 free searches. It’s actually designed more for paid search advertising than for organic SEO, but it can still be quite useful. Here’s a screenshot of what you get. To get more detailed information, you can sign up for a free trial of WordStream Advisor. This software is designed to help businesses streamline their PPC campaigns and better optimise for conversions. You do not have to provide any credit card information to sign up for a free trial with Wordstream. However, they do request a company name and website. This is a bit of an “honourable mention,” but you can sign up for a free week of access to LongTail Pro for just $1. While I did choose not to go through their entire sign-up process, it’s definitely worth checking out. The tool has a great reputation. They also offer a “Long Tail Bootcamp” seven-day video course. 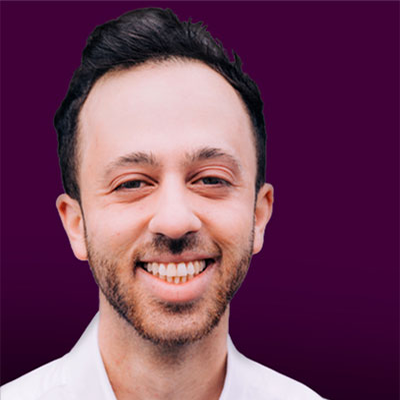 It’s worth noting that this is geared primarily toward building an “authority site,” which usually pertains to monetization through affiliate marketing. So if you’re trying to find keywords for your brick-and-mortar plumbing business, the course might not be as useful for you. Answer the Public is a longtail keyword tool that’s primarily designed to help you find keyword ideas. It uses a really cool graphical visualization technique to show you questions that people are typing into Google Search. Here are some screenshots of the graphics the site generates for any given keyword. These are what it generated for the keyword “keto,” localized to the UK. Here’s the second visualisation, organised around prepositions. These are queries that include any of seven prepositions. At the bottom, you’ll find a set of alphabetical lists, containing all of the questions and preposition queries that Answer the Public found. Answer the Public can be a fantastic way for you to brainstorm for new content ideas. For many types of businesses, you’ll find yourself running through all of the “obvious” blog post topics pretty quickly. Answer the Public can help you find fresh new ideas — and, as a bonus, you’ve got a good chance of ranking for these kind of answer queries. What sets Bulk Keyword Generator apart from other, similar tools is that it’s designed specifically for small local service businesses. It has two options that you can use: “Keyword Suggestinator,” which walks you through the process of narrowing down your business type, and “DIY Generator,” where you can enter your location and services manually. In the “Keyword Suggestinator,” the first thing you’ll need to do is select your business type from a drop-down menu. Because this tool is so different from the others, and has a very specific niche focus, I’m not using our “keto” example keyword this time. The next step is to enter your locations. I chose Dartford, Northfleet, and Gravesend. Then, once you’re done, hit the “Generate Keywords” button. 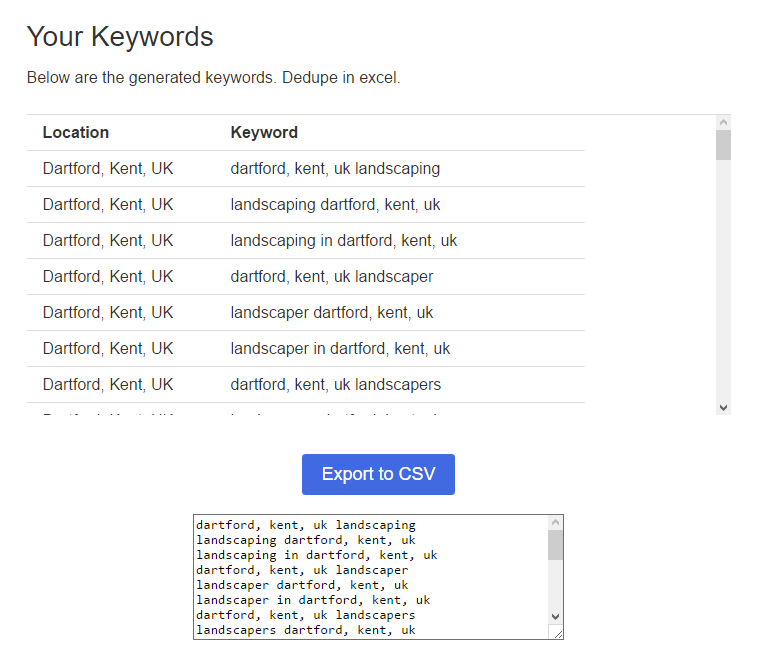 Here’s a screenshot of what Bulk Keyword Generator came up with for landscaping businesses in these towns in Kent. In total, the website generated 405 keywords, which can easily be exported to a CSV file or copy-pasted from the plaintext box. This tool can be quite useful for service businesses, both for SEO and for PPC advertising. FAQ Fox is rather unique, and although it doesn’t draw from Google directly, I thought it was worth a mention in this list. FAQ Fox actually scrapes any site you enter manually, helping you do market research by finding common questions your audience is asking. This is quite useful for finding questions asked in places like Reddit and Quora, as well as on niche-specific forums. You’ll need to enter a keyword, then enter sites to scrap in the box below. 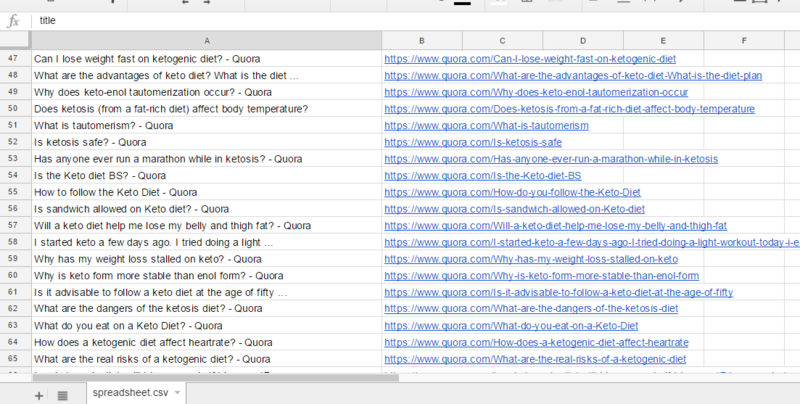 I used “keto” as the keyword, and chose Reddit and Quora as our sites to scrape. Beneath that text box, you’ll see a list that says, “Pick a category of starter sites to search. (Optional)”. I selected “Health/Fitness,” as ketogenic diets indisputably fit into that category. Click “Start Search,” and the site will generate a CSV file for you. Here’s a screenshot of that CSV, opened up in Google Sheets. At the top, which is visible in the screenshot, you’ll see post titles and links from Reddit’s /r/keto subreddit, one of the top online communities for keto dieting. If you scroll down further, there are also questions from Quora, the other site I entered manually for FAQ Fox to scrape. From the Reddit post titles, you could definitely find some potential blog topics. The Quora questions also provide plenty of ideas. You can see that people have questions about whether keto works, whether it has any health risks, and what kind of foods they can or can’t eat. Overall, FAQ Fox is another useful tool to have in your keyword research and market research arsenal. Google Keyword Planner may not be as useful as it once was, but there are actually quite a few great free keyword research tools out there. Some of them, like the SEOBook keyword tool, provide search volume data. 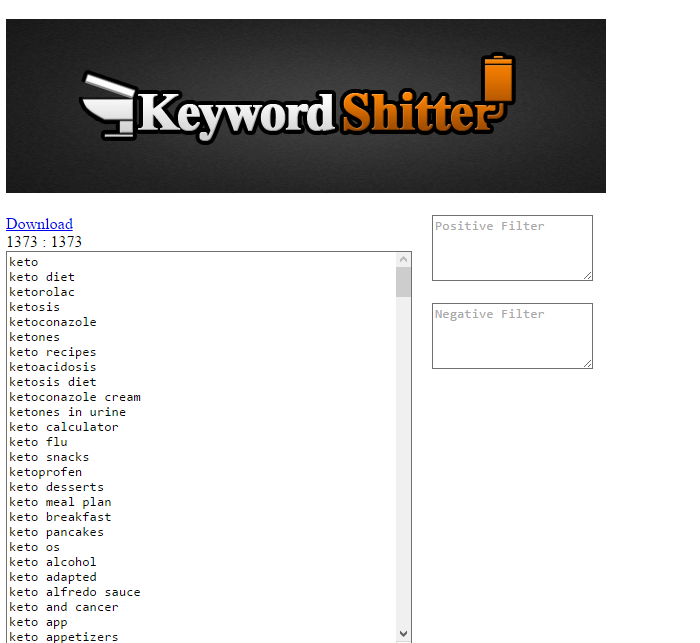 Others, like Keyword Shitter, focus on generating longtail keywords via Google Suggest. And still others, like Answer the Public, use unique approaches to help you brainstorm content ideas. If your budget just isn’t ready for a full subscription to something like Ahrefs or SEMRush, these tools can be a great alternative that can help you kickstart your SEO campaign and find the right keywords to target. If you’re still not quite sure which keywords you should be targeting, you can always feel free to reach out to us at Fine Tune Digital. Even if you’re not sure if you’re in the market for full SEO services, we offer free consultations that can help you get on the right track.